Brighter Than the National Outlook. New research from Credit Suisse predicts nearly one in four American malls will close by 2022, Fortune Magazine recently reported. Fueled by the rise in e-commerce, store closures are reaching epidemic proportions; Amazon sales continue to rise as sales from brick-and-mortar stores fall. What does this mean for Estero’s two major malls? 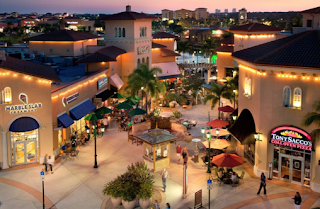 Although the numbers sound astounding (20-25 percent of malls predicted to close over the next five years), Coconut Point Mall and Miromar Outlets are unlikely to be affected. Simon Property Group, the nation’s largest mall developer, shed its low-end malls a few years ago and has been investing in the success of stronger properties like Coconut Point. Miromar Outlets is privately held by Miromar Development Corporation and is also likely to weather the “retail apocalypse” just fine. While both of Estero’s malls have experienced recent store closures — including large spaces vacated by Sports Authority and World Market at Coconut Point — there also have been new store openings. Coconut Point is dividing the 40,000-square-foot space left by Sports Authority for use by two new tenants: Total Wine & More and Tuesday Morning. Clothing retailer Soft Surroundings and restaurant MidiCi Pizza are also currently under construction at Coconut Point. Diversification is key to the continued health of any mall, according to industry experts. Thriving malls will be less apparel focused and will include more entertainment, dining and lifestyle/fitness opportunities, said Fortune Senior Writer and retail expert Phil Wahbe in “The Future of Malls in America.” He predicts Simon properties will continue to thrive as other malls vanish. Coconut Point is on top of the diversification trend, as several interesting tenants have opened within the last year. This includes an Italian bakery (Sospiri), an interior designer (LuxSpaceLiving) and an innovative concept combining apparel sales with dining: Tommy Bahama Marlin Bar. This “oasis” from shopping offers a walk-up bar where weary shoppers can enjoy a mojito, tacos and a key lime pie pop. Fortune reports that Simon’s overall occupancy rate for its 108 malls is strong at about 96 percent. Coconut Point’s occupancy has remained constant since its opening, Grofik said. The newly opened Towneplace Suites by Marriott should drive even more traffic to the mall. Divieto Ristorante (fine Italian dining) is another promising addition. At Miromar, Wasabi Japanese Steak House and Sushi Lounge has opened on the mall’s south end, and a new H&M (a Swedish clothing retailer) is under construction nearby. Miromar offers 20 dining options, from snack vendors like Auntie Anne’s Pretzels to upscale restaurants like Wasabi, while Coconut Point offers 28 dining locations. On the casual end, there’s burgers from Five Guys, and on the upscale end, there’s Ruth’s Chris Steak House. store (Dillard’s) anchors the south end. Special events like farmers markets, art festivals and charitable walks add to the foot traffic at both malls during the peak season for vacationers and seasonal residents. Grofik says Simon, as a corporation, has always adapted to changes in the market and will continue to do so. She sees the future particularly bright for Coconut Point Mall, especially if Estero residents continue to support their local retailers. “Residents need to realize that the more local dollars spent here and the better the tenant performance, the easier it is to retain key retailers and secure new leases for vacancies,” she advised. ©ECCL - June 2017 Report.